A common issue for retailers, both inside and outside the mobility industry, is that of internet sellers undercutting prices and eroding margins from bricks and mortar stores. The situation has left many retailers questioning the best course of action as the trend in consumers to turn online continues to increase. For southern-based Lifestyle and Mobility, the key is carefully selected products. The topic of eroding margins for retailers battling with lower prices often found online has left many at a loss for the best way to respond. Should prices be lowered and margin lost in order to secure a sale? The recent fate of Carillion stands as a testament to the woes that befall companies that are willing to walk the tightrope of tiny margins to secure business. Speaking with Aaron Sverdloff, Managing Director for Lifestyle and Mobility, he told THIIS that the company has avoided becoming involved in costly price wars by wisely choosing what products it promotes and sells. Aaron told THIIS: “We like to focus on manufacturers who are concerned about the quality of their products and how they are being sold, manufacturers such as TGA, Quickie, Invacare, Quantum and Ottobock. Sales of these products tend not to be driven so much by price, but more on the quality and features of the products. The strategy seems to be working for the mobility retailer who expanded its retail operations across the South throughout 2017. Aaron discussed the main focus driving the company forward in more detail. 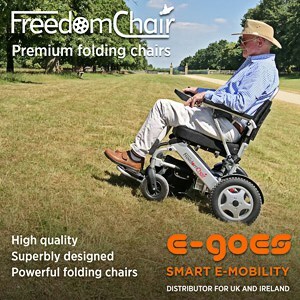 “Over the last few years, our focus has been to become a known specialist provider of active wheelchairs and powerchairs. The products can range from a basic specification or include specialist controls such as head, chin, and environmental controls for use in customer homes. Each client’s needs are assessed and the specification provided is always tailored according to those needs,” he said. Headed up by Business Development Manager Simon Greenway, Aaron explains how he has taken the specialist centre from strength to strength, growing that side of the business significantly. According to the successful southern retailer, this strategy delivers better commercial efficiencies and a better experience for customers, both in the short and long run, enhancing Lifestyle and Mobility’s reputation and business growth. “It is one of the ways that we help ensure we aren’t competing with the online boys on price. Generally, these aren’t the types of products they are usually stocking because they tend to be on the higher end of the price spectrum and require more specialist knowledge. They are more after the lower end of the market, with products that may look good on screen but don’t provide the same quality for the customer,” continued Aaron. The retailer recently won TGA’s coveted Dealer of the Month Award for December after achieving significant success supplying TGA scooters and was awarded exclusive trade discounts, free PR support, as well as a bottle of bubbly. Darren Macey, Business Development Manager for Lifestyle and Mobility, also shared the importance of building relationships with the right suppliers. “We regard our relationship with suppliers as very important,” commented Darren. Discussing the recent TGA accolade, Darren discussed what products were proving particularly popular amongst the retailer’s customers. Having a clear understanding of what their customers are looking for plays a central role in the retailer selecting what products it stocks as well. “Southend and Bournemouth are densely populated areas, many people live in flats or apartments and so have limited storage space. Despite this, they still want a medium-sized scooter with all the bells and whistles. They get that with TGA’s Zest Plus. The folding Minimo Plus 4 has also done well and we are starting to see healthy sales of the new 8mph Ibex,” continued Darren. Cleverly choosing the right products to stock and suppliers to work with has also allowed Lifestyle and Mobility to feel confident enough to offer its customers a ‘Price Match Promise’ without being constantly forced to match their products to prices offering little or no margin. “It really is the case that our strategy is driven by good quality products. In our store, we offer a price match promise, however, if you search for the higher-end products online, they don’t tend to be readily available without some margin being retained, so we are happy to price match,” explained Aaron. By carefully picking the right products to sell, Lifestyle and Mobility’s strategy is one of long-term sustainability, differentiating itself from competitors using prices as a USP. For many retailers worried about the fear of losing customers to competitors willing to undercut on pricing, the lure of slashing prices to keep their customers can seem very appealing. This short-term thinking, however, can do far more harm than good in the long-run, as price wars often prove to be a race to the bottom where no business really wins and the service & quality of product provided to the customers tends to suffer.